Yes, Temple Meads station is at the centre, but Temple Quarter includes the whole surrounding area all the way to the St Philips Causeway. This is going to be a huge development, with or without the semi-mythical Bristol Arena. The Temple Quarter partnership have launched a survey to gather views before the next stage. As they say “Whether it’s how you access and use the station, provision of green and public space, affordable housing, jobs and employment, or something else entirely, we want to know what’s important for you to see in the area.” We hope to get a better vision for cycling and active travel than the 2015 Temple Greenways consultation. The survey is pretty quick to complete so do take a moment to do so. 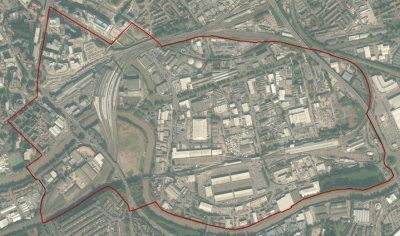 Responses will be fed back to the masterplanning team, commissioned in July 2018 by Bristol City Council and partners with the aim of accelerating the regeneration of the Temple Quarter district, including proposals for Temple Meads station. On Question 3 please include ‘Bicycle parking’ in your top three new features which would most improve the area for you. Temple Quarter is a key piece of the emerging jigsaw of a proper City Centre Cycle Network.